Envelopes and flyers explaining package options and providing online ordering access codes are supplied to most schools and sent home with your child prior to the day of photography. At most schools there are 2 ways for parents to order school photos, online or envelope. For more information on how to order head to our how to order page. Distribution of photographs by the school can take several days. If other students have received their package, but your child has not, please wait 3 working days before forwarding the details to: enquiries@advancedlife.com.au. Once you enter your school’s 9 digit Community Code, the package options your school has chosen are presented on the ordering website, together with the pricing. Depending on what package design options your school has chosen, we will always take a portrait of your child and possibly also a group photo of the class/year(which will be presented as either a traditional group photo or the full set of portraits for that class/year in a composite style). To view your package options and prices, enter your 9 digit community code found on your order envelope or flyer in the field at the top of this page. You will then be directed to your school community portal where you can order and review your package options. advancedlife send receipts/invoices to the email provided. In some instances we have found that the emails have been misdirected to “Junk Mail”. Please check your junk mail and if you you have not located your receipt please provide your child's name, class and details in the field below to submit an enquiry. You can reorder all photo packages through your School Community Portal, just follow the "how to order" steps and your order will be delivered to the school. 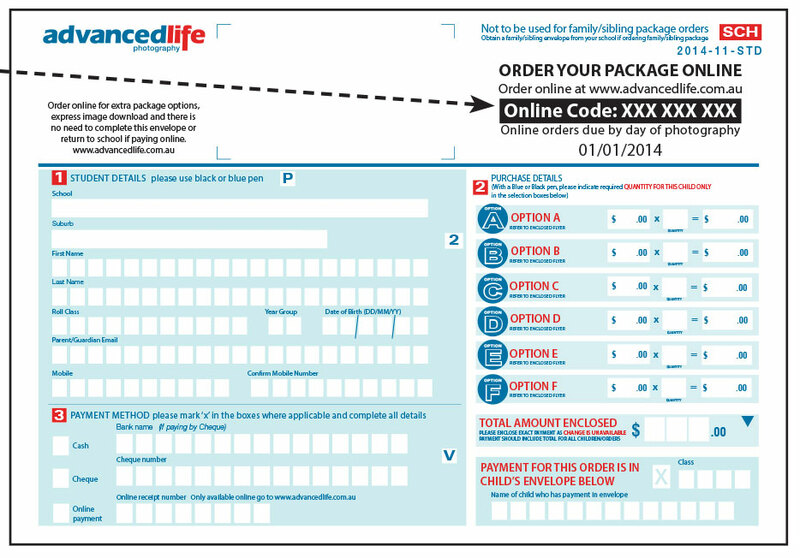 You can also reorder packages through your advancedyou personal site, using the unique 9 digit code for your child, found on your photography package or advancedyou card. To head to this site enter your 9 digit secure code in the field at the top of this page. Once oyu are redirected to the advancedyou site click on photography packages in top menu. All orders made on the advancedyou site will be delivered to the address you supply on the site.